Eleganze, a boutique and tailoring unit for ladies based in Luz’s Ginza Complex has opened a second branch on TTK Road. The new 1000 sq. 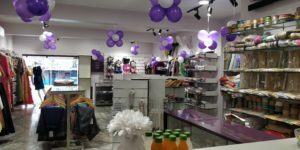 feet space now stocks lingerie, fashion jewellery and accessories in addition to fabrics, readymade dresses, laces, dupattas, gowns and legwear. The unique point of the boutique is that it has readymades upto 5XL. Ptiti, the owner of the boutique ventured into this business 2 years back because of her passion in designing. She sources her fabrics and dresses from different cities and leading brands. “Alwarpet is a prime location and a competitive area for boutique business so I decided to start a second branch here”, she said. The store is located at 444, TTK Road and is open from 10.30 a.m. to 9 p.m. and is open on all days of the week. Ph: 48563616 / 8148936091. This entry was posted on Tuesday, February 5th, 2019 and is filed under Shopping, Stores. You can follow any responses to this entry through the RSS 2.0 feed. You can skip to the end and leave a response. Pinging is currently not allowed.